Keeping things "orderly" doesn't mean doing the same-old same-old. 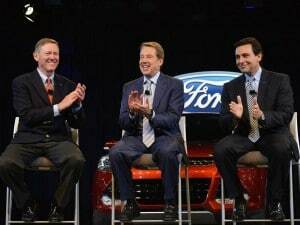 Ford CEO Alan Mulally, Chairman Bill Ford, and CEO-to-be Mark Fields at Thursday's news conference. July 1 will bring one of the biggest transitions Ford Motor Co. has experienced in years – but don’t expect to see many changes, short of who gets the best parking spot in the underground garage at Glass House, the automaker’s suburban Detroit headquarters. In what was arguably the worst-kept industry secret in some time, Ford officially confirmed that the 68-year-old Alan Mulally well retire as CEO and hand the reins over to his hand-picked protégé, Mark Fields at the mid-year mark. And in both their Thursday morning news conference, as well as subsequent interviews with TheDetroitBureau.com, the two executives repeatedly sounded the same phrase to describe the “smooth and orderly” transition to come. While there’s some careful media coaching at work here – consumers and investors alike crave a sense of consistency – that is much more than PR-speak at work. 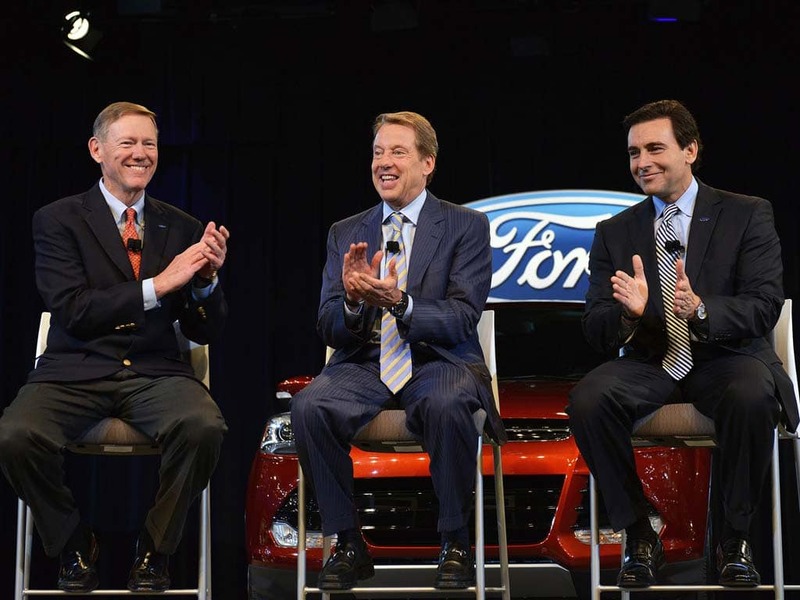 Even when the former Boeing executive first came to work in Dearborn, Mulally said he made management succession one of the key elements of his One Ford strategy. And for good reason, considering the maker’s history, echoed Fields. As far back as the days of founder Henry Ford, the automaker was traditionally a hotbed of political infighting that typically put turf-building ahead of the company’s long-term welfare. That often meant that whenever management changed, so did Ford’s strategy de jour, which often left the rest of the workforce paralyzed, trying to figure out what they were now supposed to do. The damage that can cause became readily apparent in the years leading up to Mulally’s hiring, as Ford seemed to be spiraling towards collapse. As it turned out, the major shift initiated by Mulally helped the maker avoid bankruptcy – the only one of Detroit’s Big Three to sidestep the necessity of a federal bailout. That doesn’t mean Fields is putting Ford on cruise control. Far from it. Referring to the One Ford strategy as “very dynamic,” he stressed that it has to constantly be adapted to a rapidly changing world, whether from competitive threats or external forces that range from economic ups-and-downs to shifting fuel prices. Ford clearly has a range of issues it has to cope with, ranging from the continued rebuilding of its European operations to the growth of its presence in China – where it just last month introduced the troubled Lincoln brand. Indeed, during his tenure, the fate of the struggling luxury brand could be one of Fields’ biggest challenges. Meanwhile, the 53-year-old Ford veteran said he does not foresee any significant changes in the automaker’s management team. That means his second-in-command, Joe Hinrichs, will remain the President of the Americas. At least “for now,” there will be no one taking Fields’ old post as Chief Operating Officer, a role one insider described as “training wheels,” specifically created for Fields 18 months ago to prepare him for the upcoming management handover. Even before he got the COO title, Fields seemed destined for the top job – it’s “his to lose,” was a common refrain from Ford insiders and industry observers alike. But how he got in that position is a bit more complex. Fields was originally a product of the bad-old-Ford era of infighting, but he was quick to sense – and embrace the changes Mulally was struggling to implement. At a critical meeting during his mentor’s initial days at Ford, Fields exposed himself to potential ridicule at the company’s regular Thursday morning management meetings by acknowledging a major problem with a critical product launch. Both men recall how Mulally’s response made Fields seem a hero, rather than a zero – changing, almost instantly, the corporate culture to accept the idea of exposing problems and seeking help. “Mark was a key member of the team when I arrived that helped us implement the One Ford plan,” says the soon-to-retire CEO. Mulally also pointed to Fields’ track record as “a proven business leader around the world,” who has run a variety of Ford operations including its European subsidiary and its one-time controlling position with long-time Japanese affiliate Mazda Motors. As to his own plans, Mulally suggested that he doesn’t have any new jobs in the offing, despite the constant flow of rumors. “I’m going to be laser-focused on completing this smooth and orderly transition,” he insisted, adding that he really has come to like the idea of slipping into a comfortable retirement at an age when his tennis game is still strong enough to take on much younger challengers. This entry was posted on Friday, May 2nd, 2014 at and is filed under Automobiles. You can follow any responses to this entry through the RSS 2.0 feed. Both comments and pings are currently closed.